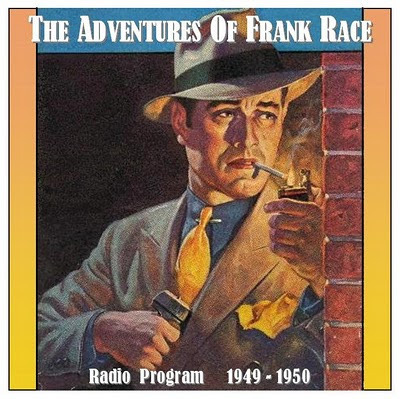 The Adventures of Frank Race was an American radio adventure serial syndicated by Bruce Eells Productions. The 30-minute program's first East Coast broadcast was 1949, and the show ran 43 episodes. Because it was syndicated, it aired on different stations on different days. For instance, in New York City, the first episode ran on WINS on April 9, 1949. The series was broadcast on the West Coast from 1951-52. Many things were changed during the war; the face of the earth was altered and the people of the Earth changed. Before the war, Frank Race was an attorney, but he traded his law books for the cloak-and-dagger of the OSS. When it was over, his former life was over, too... adventure had become his business! Frank Race mainly investigated international insurance scams around the globe in various exotic locations, making him something of a cross between James Bond and Johnny Dollar. After Tom Collins played the title role for the first 22 episodes, Paul Dubov took over the lead role. Tony Barnett portrayed Race's sidekick, Mark Donovan. Other actors included Jack Kruschen, Wilms Herbert, Lillian Buyeff and Harry Lang. The series was written and directed by Joel Murcott and Buckley Angel. Ivan Ditmars provided the background organ music. many thanks for this top show.